In the world of permanent installation, selecting a rack of the proper size is just the beginning. TMP Pro has experts to assist you in calculating your electrical, thermal, and cabling needs and carries products from top rack manufacturers like Middle Atlantic, Lowell, Raxxess and more. Be sure to keep the components below in mind. They are essential to building an efficient and reliable rack system. Above 85�, the reliability of digital equipment declines drastically. The more sophisticated the equipment, the more vital thermal management becomes. TMP Pro carries a full complement of fans, fan controllers, filter kits, vents, enclosure tops, vented shelves, and vent blockers. Just as importantly, TMP Pro reps have the knowledge to configure a cooling system based on the specific equipment and environment related to your system. Rack systems require abundant electrical power and access in a relatively small area. Electrical management cannot be done on the cheap, and without planning for it adequately, a quoted rack installation will quickly go over-budget. TMP Pro reps can help you draft accurate quotes by identifying the vital conditioning, distribution, lighting, and raceway products your system needs. Aesthetics, scalability, accessibility, duty load, and cost are all considerations when specifying a rack. TMP Pro has access to Stand-Alone, Gangable, Open Frame, Wall Mount, Panel Mount, Slide-Out, Desktop, Turret, Rolling, and Seismic-Rated rack enclosures from leading manufacturers. We have you covered for every type of installation from A/V and broadcast to IT and security. Cable Management components are vital to the efficient building, wiring, and maintenance of critical rack systems. Without them, repairs or updates to a system can become an expensive and time-consuming undertaking. TMP Pro offers cable spools, lacer systems, grommets, cable hangers, and trays of all kinds, plus the rack-building know-how to design your system correctly. 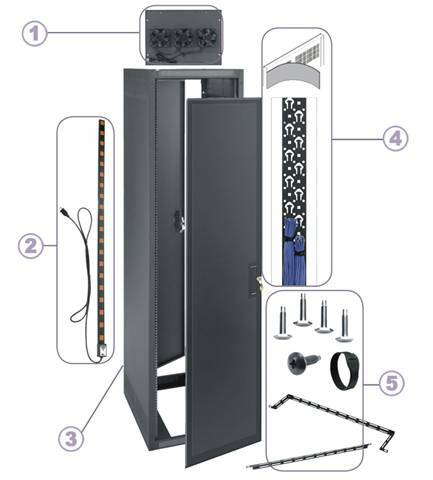 TMP Pro offers an arsenal of accessories to make building a custom rack easy and efficient. Rackshelves, media storage, LCD mounts, custom rackmounts, blank panels, custom panels, security doors, rack hardware, and rackrails are available from a host of manufacturers. When you order from TMP Pro, you get everything you need the first time. You stay on budget and on time, and your client sees a smooth, efficient job. Have you been presented with a spec for amplifiers, processing gear, playback decks and storage, but nothing about the racks to hold it all? We can review your specs and quote you a rack system based on all the equipment involved, making sure that none of the essential components are missing.